Halsey’s Country Flowers is a local Angola, IN florist delivering courteous and professional service, along with the highest quality floral and gift items around since 1978. Welcome to our shop’s website - conveniently open 24 hours a day!! We hope you enjoy your online shopping experience with secure ordering right at your fingertips. If desired, you may also call us to place orders direct at (260) 665-5893. It is our pleasure to assist you with any local, as well as worldwide deliveries and remember that corporate accounts are always welcome. For your convenience, we offer daily delivery to local hospitals, funeral homes, and Trine University (Tri State College). Halsey’s Country Flowers is conveniently located 1 mile from Prairie Heights School and is open Monday through Friday 9:00 to 5:00, and Saturday 9:00 to 12:00 noon. Open Sundays for emergencies and funeral work only. Wedding & Special Event Flowers ~ Your wedding, special event or holiday party is sure to be a “blooming” success with flowers from Halsey’s Country Flowers! Call us in advance at (260) 665-5893 to schedule a consultation with one of our talented floral experts. 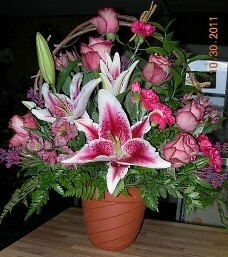 Let us add the beauty of flowers at all your occasions and locations - large or small. Wonderful All Occasion Gifts ~ Browse our assortment of Dish Gardens and Green & Blooming Plants for a gift that will instantly bring life to any room or office. We create Fruit & Gourmet Baskets and All Occasion Gift Baskets, as well as offering a nice selection of Balloons, Baby Gifts, Candy/Chocolate, Unique Gifts, Silk/Artificial Flowers, Stuffed Animals, and more. 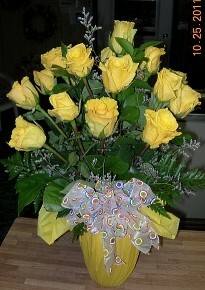 Sympathy Tributes & Funeral Flowers ~ Ask our staff about customizing a floral tribute to a departed friend or loved one. We can help you choose funeral flowers that beautifully convey your expressions of sympathy and serve as a lovely memorial to the deceased. 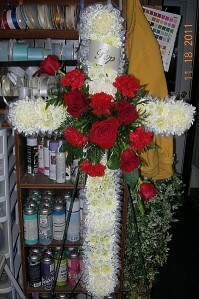 We also have Lighted Solar Crosses, Sympathy Throws, and Silk Wreaths available. CLICK HERE TO VISIT OUR PHOTO GALLERY FOR MORE CUSTOM FLORAL AND GIFT ITEMS! Thank you for visiting our website with flowers delivered fresh from your local Angola, IN florist and convenient online ordering 24 hours a day!! VISIT OUR EBAY STORE Creations&TreasuresByRenee! VISIT OUR EBAY / AUCTIVA STORE!